Despite learning to knit when I was quite young, I've never really got beyond the basics - I can cast on and cast off, do plain and purl stitches and can do stocking stitch with them, but unfortunately not ribbing as I get in a tangle with which side the yarn is supposed to be and when, and I can increase and decrease - but I can't decipher knitting patterns (they send me into a similar state of panic as 'filling in forms' does!) and I hold the needles really awkwardly (I'm one of these that has to put a needle down between stitches) which makes for quite slow progress and cramping fingers/hands so that I can't knit for very long at a time. And other than stripes (although I do like stripes), patterns are pretty much beyond me. When my son was younger, I did knit him a few hoodies and jumpers, but the bigger he got the more completely impractical it got because he would be grown out of something before I ever got around to finishing it! 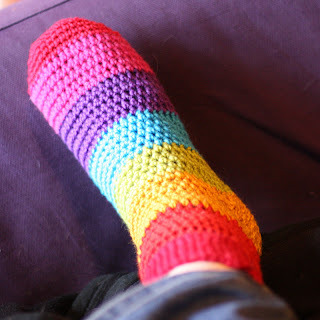 The idea of knitting a sock (or a pair of them even!) is not something I would contemplate, but having got my head round the basic crochet stitches, and persevered with the reading the patterns thing, I downloaded this pattern from Ravelry and had a go. I struggled a bit with the instructions for the heel, but the rest of it was pretty straightforward and what not knitting with patterns has at least taught me, is how to improvise and play around with stuff until it looks 'right' at least. Once it 'clicks', crochet is just so very much quicker than knitting and so much easier to do patterns with that would be far more complicated to knit. Still loving it, and if you're just learning, stick with it - the results are well worth it. They look lovely and cheerful! Hope your foot is better soon.